Aug 16 latest: Excellent Picardy Place article by Broughton Spurtle. 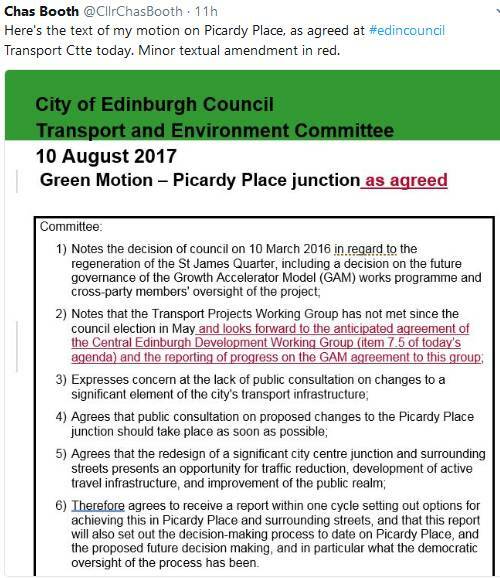 Picardy Place has long been recognised as a top blackspot for cycling and it is also far below its potential as a central Edinburgh pedestrian place. Therefore we are particularly pleased that there will also be a report to the Transport Committee covering opportunities for traffic reduction, cycling and walking infrastructure and improvements in the public realm. Picardy, however, at the heart of everything, has remained consultation-free, with no detailed proposals published since the tram documents in 2009. As a result, speculation has proliferated and artists impressions, many of them almost certainly unrealistic, have gained wide currency on social media. 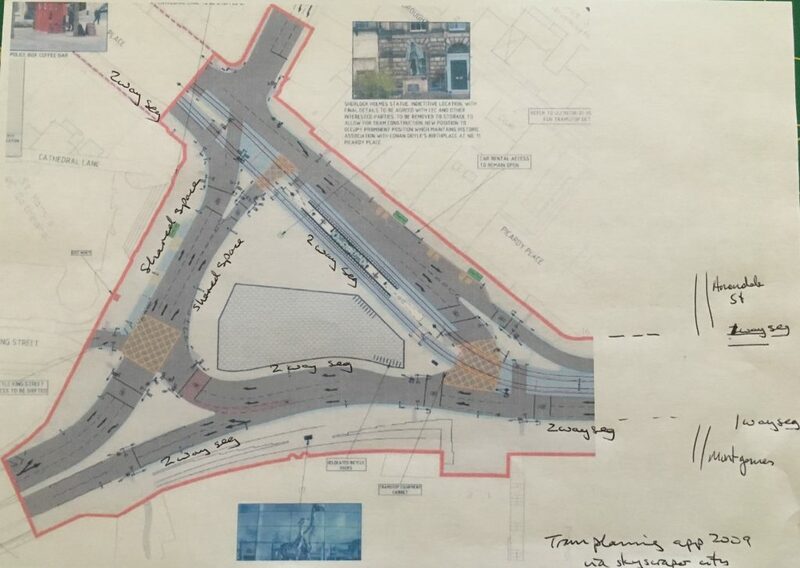 Part of the background to the lack of consultation may be that, unlike Leith Walk or the West-East cycleroute, the Picardy design appears to have come from consultants working largely for the developers rather than for the Council, albeit with Council involvement. In July this year ‘stakeholder’ groups, including Spokes and Living Streets, were invited to meetings by the consultants and at last shown the current plans. These plans, however, have still not been published, and there appeared to be no intention to hold a public consultation. The plans are undoubtedly a big improvement for cycling and walking compared to the present layout – but are much less good than they could be. This particularly matters for a council with targets not just to increase cycling, walking and bus use but also substantially to reduce car use (from 43% of all trips in 2010 to just 31% in 2020). Moreover, the Council has made real progress on these targets, to a point unique in Scotland, and it would be tragic if new developments are allowed to slow or derail this progress. Unfortunately, in the new plans the area still looks dominated by motorised traffic, replacing the current (very unpleasant) roundabout by a major gyratory. There are other problems, such as insufficiently wide cycleroutes and footways, and several areas of ‘shared space,’ particularly in areas where many pedestrians are likely to be ‘mingling’ whilst many cyclists will be travelling from A to B. Following the developer meeting with Spokes and other ‘stakeholders,’ the annotation on this drawing is from memory by Spokes – it attempts to show the proposed cycle facilities, comprising various “2-way seg” routes (including 2-way down to Annandale Street and to Montgomery Street) and the main “shared space” areas (there are others). Note that the base map is from 2009 and does not represent the exact current proposals for the road system, although a 3-sided gyratory is still planned – but as far as we know no other detailed plan has been released since 2009. Retaining more of the existing green space and mature trees. There will now be a public consultation, and it will be “as soon as possible”. Whether any major change will happen at this late stage remains to be seen, although we can certainly hope for smaller improvements. A huge stumbling block is that the Council, many years ago, gave planning permission for 1600 car spaces in the adjacent St James Quarter development – indeed the developers proudly point out (see the section Our Big Plan) that this is more than all the rest of Edinburgh’s public covered parking spaces added together! How great it would be if we could get closer to the Picardy concept put forward by Sustrans back in 2014! Meantime – you can help by telling your councillors what you’d like to see for the future of Picardy and asking them to feed this in to the discussions now taking place in the Council. Find your councillors here. And … can you retweet our tweet of this article? ?